With Love From Rachel: do you exude lipstick? There have been quite a few designer/cosmetic collaborations lately; this one caught my eye immediately due to my love of all things gloss. Stylist (and now designer) extraordinaire Rachel Zoe teamed up with a new brand that makes, basically, a high-end liquid lipstick in 9 shades. Instead of being solid, the product is dispensed from a lipstick-looking container in liquid form. If you prefer gloss they also have 5 colors of gloss that comes in the same unique packaging. 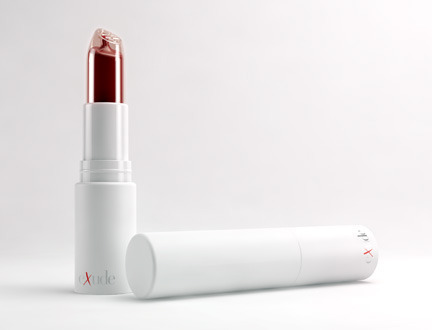 Exude Lipstick, which they refer to as "lip creme", is not your grandmother's drying, waxy lipstick. This is a cross between gloss and a highly pigmented lipstick. Sounds amazing, right? Hopefully it is, because I just spent the $29 on one in Pink #2. That seemed a bit pricey, but I do usually finish my lip gloss - it's the poor, unused lipsticks that cover the bottom of my bags. If I actually were to use all of this lip creme it would be worth the price. We shall see..
Side note: when I went to google "exude" in order to purchase the lipstick, the first thing to pop up was the word's definition which is to discharge (moisture or a smell) slowly and steadily. This actually made me pause for a moment before continuing on to the company's website. Let's hope the actual product is more, umm..appealing. I have the same one on its way to me now. I couldn't resist. I was waiting for her site to go live. I hope we both love it.